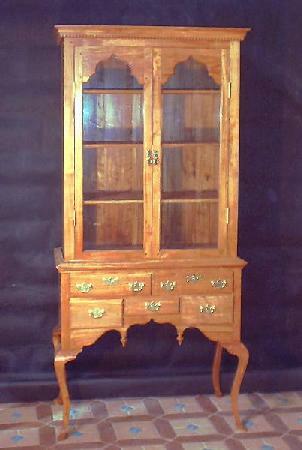 Period European and American furniture, especially the Queen Anne, William and Mary, and Federal styles have always interested me, both in terms of quality and appearance of the finished work and the ingenuity and craftmanship inherent in the design and building of beautiful and functional pieces. I enjoy working with all types of wood, but am particularly fond of standard American hardwoods, both in terms of economy and in terms of looks. Whether it comes to complicated turning, intriguing new joinery techniques, or the simple-yet-elegant look of a finely designed period piece, I pride myself on both adopting the work of the period craftsmen and adapting that work to new methods, tools and design. I am more than willing to work with you to design and craft the perfect piece to fit your needs and your space, however it is never as simple as putting a number on a piece. There are many variables in the price of furniture: the species of wood, the amount of fine detail and complexity of design, the style and amount of hardware, and more. In my opinion, the most important question is how much a customer wants to spend to get exactly what they want. I try to be flexible and to give high quality at the same time, so please free to drop me a line and begin a dialog that should result in an excellent piece of furniture for you at a reasonable price. For examples of my recent and current work, have a look around the furniture gallery and if you’re interested, let’s start designing.